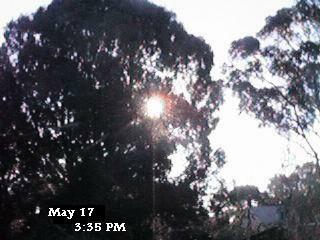 Light overload on webcam in Charlotte NC [May 22] from 7:15 AM -12:15PM - 5 hours! Yesterday, not at all the case. 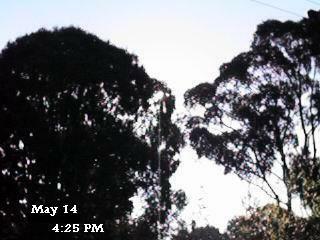 The 3:35 PM shots from Victoria Australia show an increased [May 22] Alt of 5° and Azi also seems out a bit based on logs. Photos taken at 4:25 PM 14 May 04 Azi 285-290° West Alt 15°. Photos taken 3:35 PM 17 May 04 Azi 295° West Alt 20°.